230 in stock Need More ? Non-verbal reasoning skills are a common component of 11 plus and Common Entrance exams, such as those set by the Centre for Evaluation and Monitoring (CEM), Granada Learning (GL), and the Independent School Exam Board (ISEB). 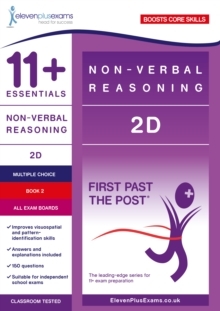 Almost every school or consortium that tests non-verbal reasoning uses 2D questions. Therefore, this book provides essential practice for tackling this element of the entrance exam. The chapters in this book are topic-based and each contains ten questions. This series will build and develop your child's visuospatial and pattern-identification skills, which are essential for success in non-verbal reasoning. Extensively road-tested by the Eleven Plus Exams centre, all First Past the Post 11+ Essentials books are perfect for use both in the classroom and at home.